THE BEYOND was legendary director Lucio Fulci’s follow up effort to his diabolical masterpiece “City Of The Living Dead.” In my opinion, and in the opinion of many other horror fans, this is Fulci’s true masterpiece. 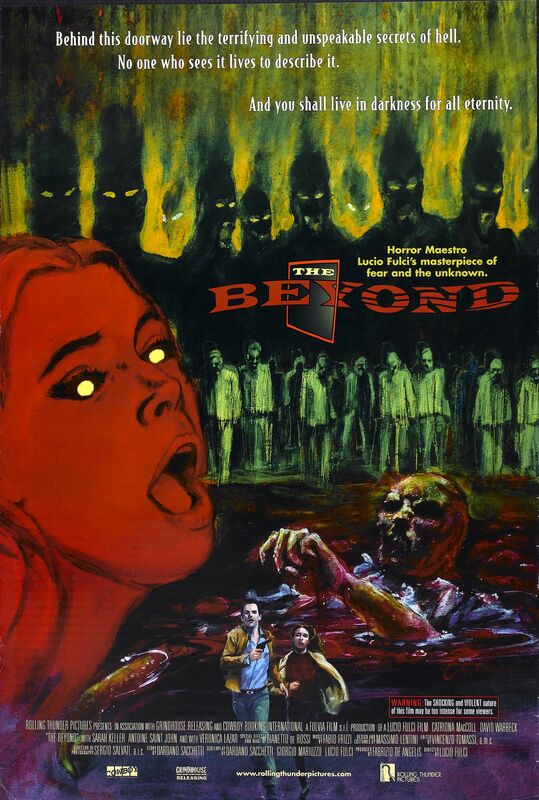 “The Beyond” is one of the most atmospheric, beautiful, and gruesome horror films of all time. From the ultra creepy sepia-toned opening to the incredible, haunting ending, this film commands the attention of viewer and captures their senses. This is a true example of a horror film with GUTS. It features some of Fulci’s most memorable gore sequences, including graphic face melting, eyeball gouging, throat ripping, flesh eating spider attacks, and one of the all time great zombie “head shots.” The fantastic special effects and makeup were created by Giannetto De Rossi (Zombi II) and Germano Natali (Suspiria), and stand out as some of the finest work in their esteemed careers. This entry was posted on August 30, 2013 at 6:41 pm and is filed under Uncategorized. You can follow any responses to this entry through the RSS 2.0 feed. You can leave a response, or trackback from your own site.